Architectural designs usually go through a variety of iterations. Beyond that, many external experts are to be consulted in the implementation phase, with their very own specifications and goals. To merge all data into ONE optimized model would be an efficient way: a complete parametric original. From the computer directly into realization! Some paradigmatic CAD/CAM applications shall be shown here in this brief overview. They were developed in different constellations. The links provided lead to further details and full credits. For a complete list of works, please refer to richdank - the complete story. Pallantis' Voronoi structure (left) and the principles of its assembly (right). 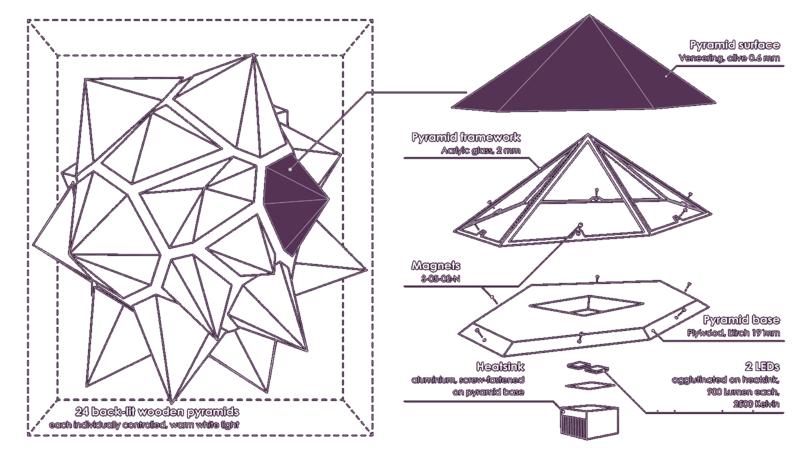 Overview of the wooden pyramids (left) and their different layers (right). 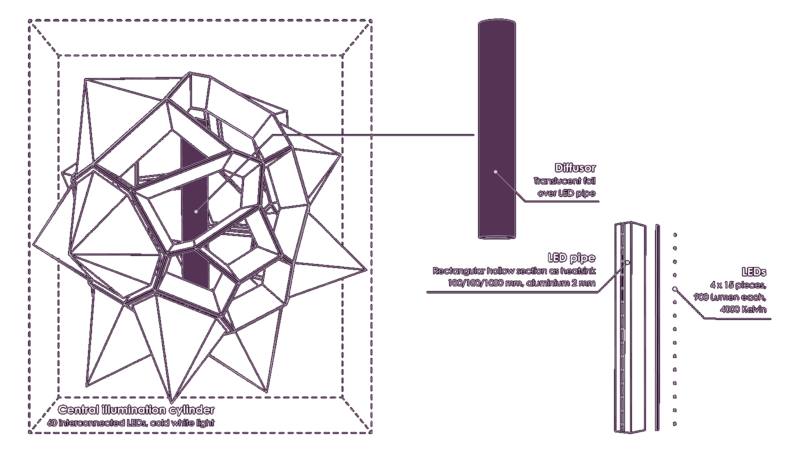 The lighting within the Algorithmic Chandelier. On display during the Designmonat 2013. 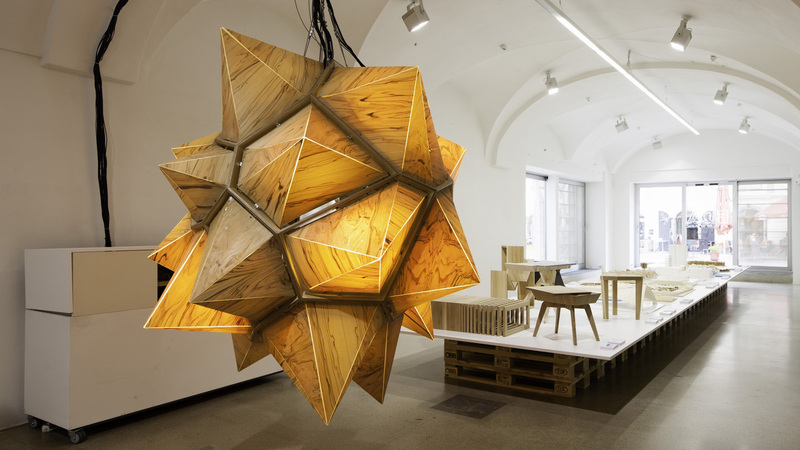 The aim of the Master Design Studio Kronleuchter at the Institute of Architecture and Media was to design an object that utilises contemporary CNC fabrication principles and takes advantage of the manifold features of the material wood. Moreover, the options of today's LED technology and its capability of being digitally controlled should fundamentally influence the approach. The work had to be fully parametric in design and production as well as interactively operable. To put it briefly, the assignment targeted the question whether an out-of-the-ordinary chandelier could be produced solely in wood. See the short video taken at the Ball der Technik 2013 to experience the outcome: Pallantis. The Algorithmic Chandelier lighting up the 25 year anniversary of the House of Architecture (left) and the Stefaniensaal at Congress Graz (right). 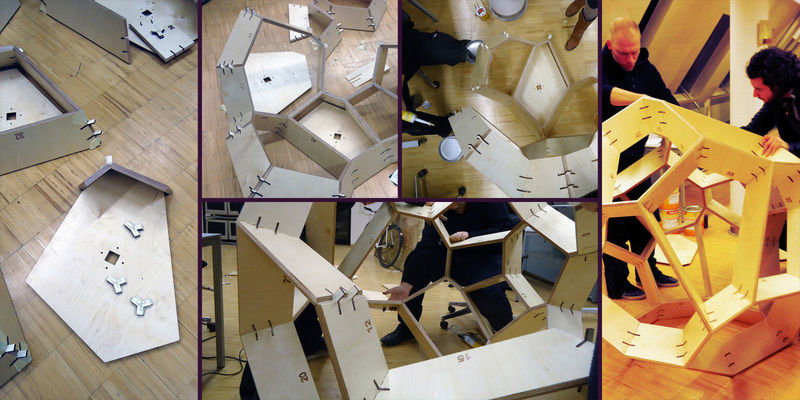 Images from the CNC production of the pyramid base planes, the 3D-Voronoi-frames and the connection elements. Fixing the steel brackets and the suspension, mounting the central illumination cylinder and attaching the pyramid bases. 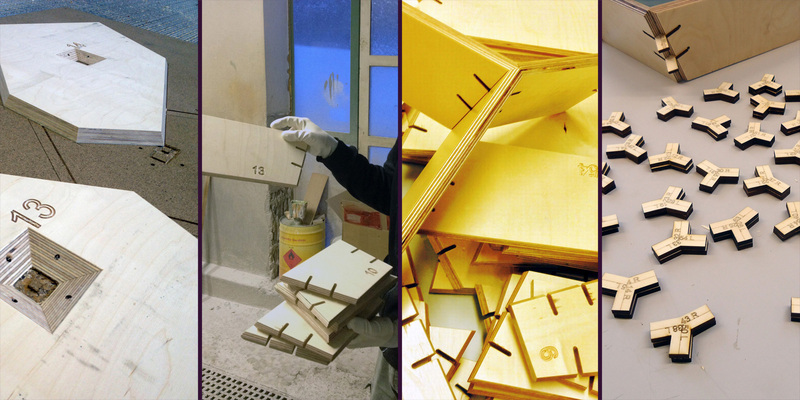 The production of the translucent olive veneer pyramids. 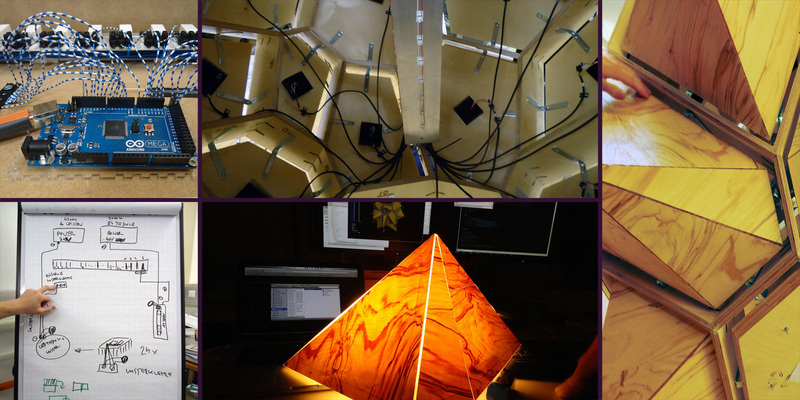 Arduino board and wiring within, testing the application and close-up of the pyramids snapped on. Interactive lighting effects and Java application that controls the output. 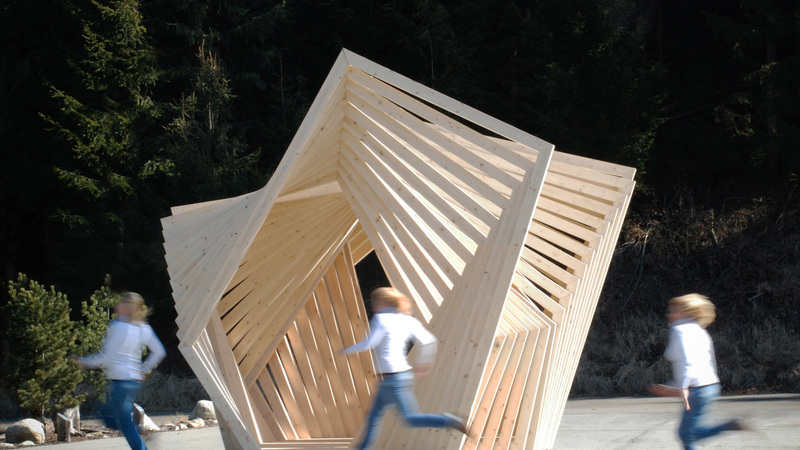 A structure and all joints solely made from timber. No glue or other fasteners or fixings allowed. For the realization use the capabilities of a 6-axes robot on an additional linear axis. Moreover the entire project must be applied parametrically! Is that possible? 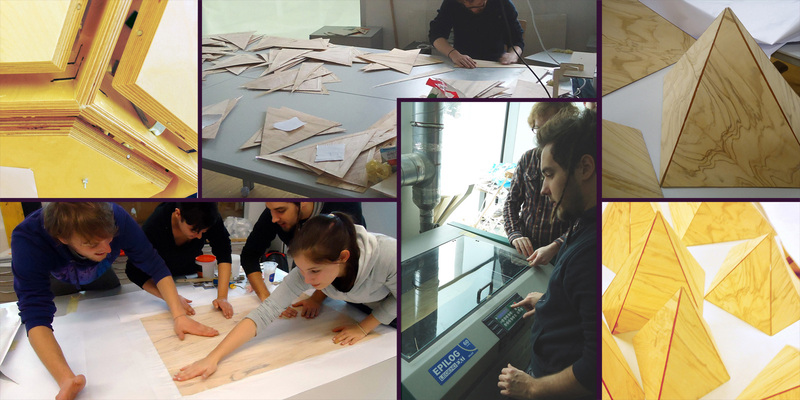 Start to analyze existing and traditional wood joints and test their possibilities in order to transform them into digital models. Next step is to improve those designs in consideration of producing all joints within the milling environment. With this data, start to design and simulate a walk-in structure. 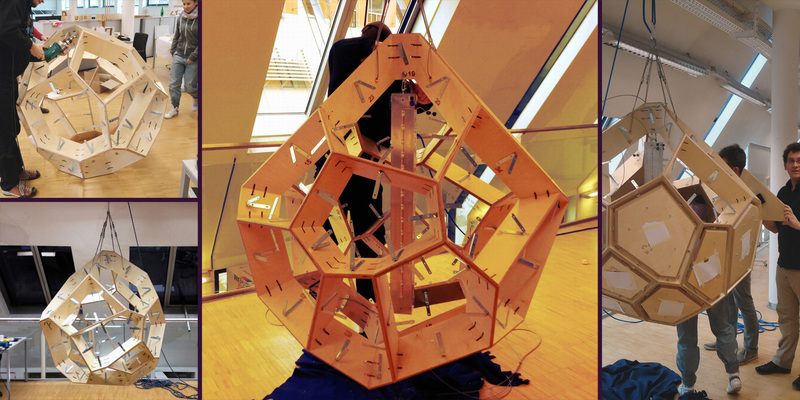 The experiments concluded with 18 individual full-scale algorithmic projects - and one completely implemented and built structure: The Framed Pavilion. 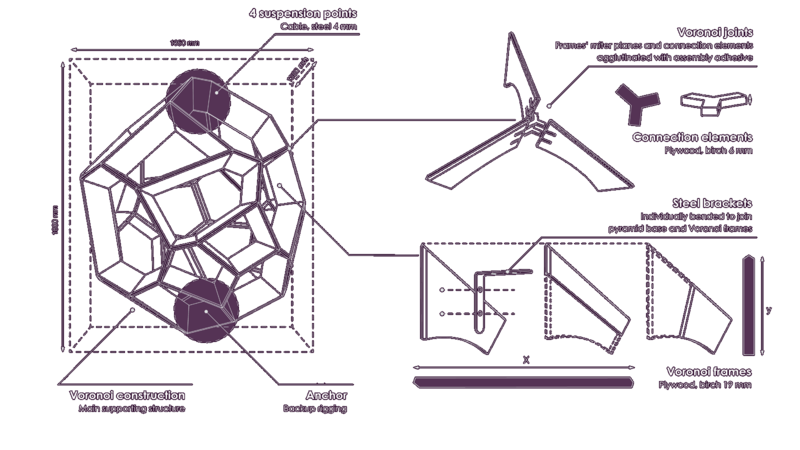 The original design intention of was to build irregular pentagonal frames mutating along an axis. The implemented algorithmic process enables the user to convert any basic surface that seems appealing. The application assists to meet the restrictive parameters such as the positioning of the wooden dowels, the minimum and maximum beam length and joint angles. Thereby it was possible to generate a morphing shape between the interior and the exterior where height variations, gaps and openings define a special ambiance. Completely implemented and built structure (above). 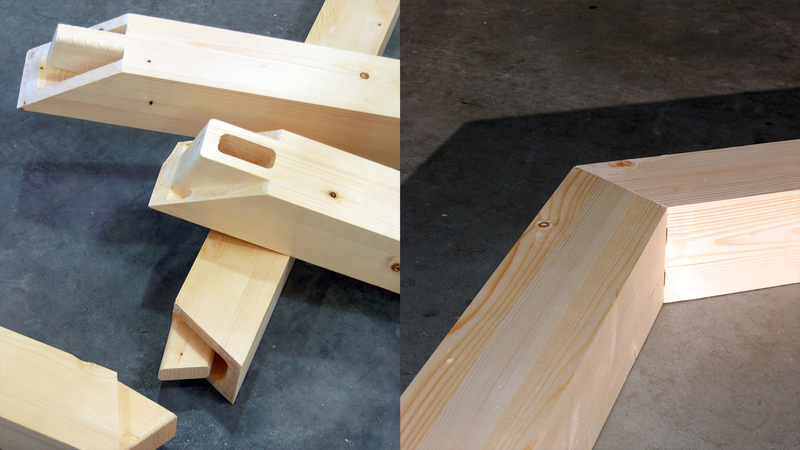 Milled parts (left) and assembled joint (right). Evolution from designed shape to finally defined frames (above). Simulating different load situations (center). Machining operations and milling path creation (below).